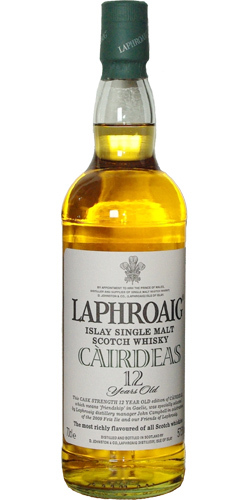 The typical Laphroaig-note unfolds on the tongue, but the combination with the fruity-fresh nose makes it really interesting. Hmm, smoked lemon and orange peel, apple slices. Fresh, salty smoke. Vanilla, a serving of oatmeal cookies. Apple sweet, greasy peat smoke. Oak chips pearl on the tongue. A licorice sweet. Warm tar. Medical, phenolic. Long, slightly dry, with cold smoke, citrus juice, tart oak and vanilla. A lovely malt in itself, but in this series of Feis Ile bottlings, it is one of the lesser gods because of its less typical character. I get quite a few burnt notes on the nose, if you know what I mean. Toasted oak, crème brûlée, a doused wood fire, some tar. I like it. There is also quite a bit of sweetness as if from vanilla, candied citrus and fermented apples. The peat is rather quiet. There is also a mild hint of rubber, to be honest. But luckily that is not disturbing. Something metallic as well, as if it is poured from a can. Despite the high ABV, the arrival is quite doable without water. Loads of citrus in the lead, followed by a feisty spiciness (pepper and salt, ginger!) and some woodsmoke, but the typical medicinal character of Laphroaig is not really present. Sweet smoke and lemons, that’s this Laffie in a nutshell. The finish is medium long – short compared to its compadres – and rather sweet and sour. Mildly drying towards the end. Lots of citrus, grapefruit, sweet smoke,wood staves,fresh wood risiny, pinewood. Adding water: lovely tones of creme brûlée . Lemon grass, sweet smoke again, some woody tannins, quite dry with a layer of lemon pie and a touch of pineapple. Smoky and little bit dry.Spicy notes in the background. N- Floral filled the glass with fresh wood shaving, black tea, roasted nuts and wee bit pungent. P- Vanilla cake, with dominant roasted black pepper quick to follow. Tart. F- Medium length, spiciness remains. 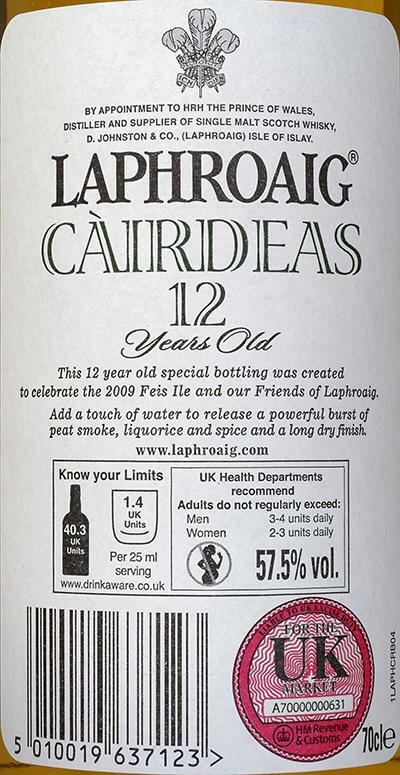 A typical Laphroaig with neat whiffs in the taste and finish. The intense peat, citrus fruits, vanilla sweetness and a subtle smoky note harmonize perfectly. Above all lies a mineral note. A great Laphroaig of appetite for more power! Wonderful peat and subtle smoke rises from the glass. Tough and oily, the streaks run down the glass wall after being poured. Mineral rock mixes with fine citrus fruits. Increasingly, the 57.5% alcohol content is noticeable. A mineral note mixes with a sweet vanilla flavor. 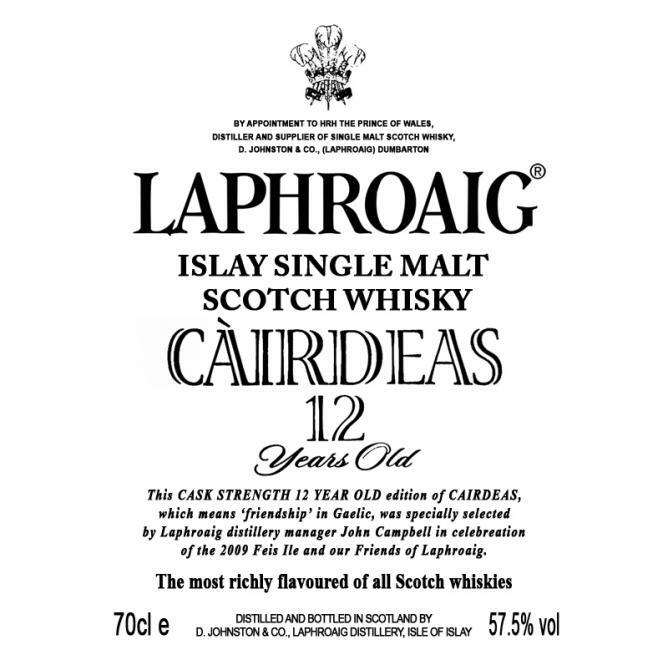 Peat, fruits, light sweetness and subtle smoke harmonize perfectly. Strong peat and sweet wood notes dominate the first sip. Then immediately a bitter oak note and smoky peat noticeable. A pleasant mineral taste is now very present and plays with the now bitter wood note. 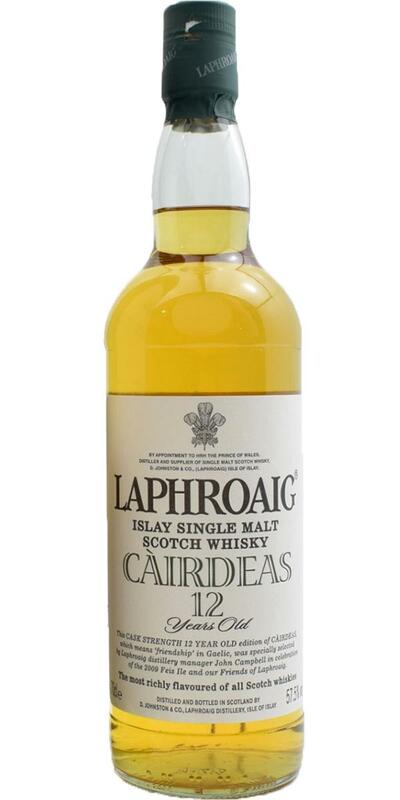 The addition of some water makes the Laphroaig seem more supple, the peat in my opinion is more intense and saltier. Sharpness and bitter notes of wood penetrate through the peat. Spices are added. Salty, with a mineral peat note, the finish begins. Despite the addition of water, the aroma on the finish is characterized by intense peat, bitter notes of wood and salty sharpness. 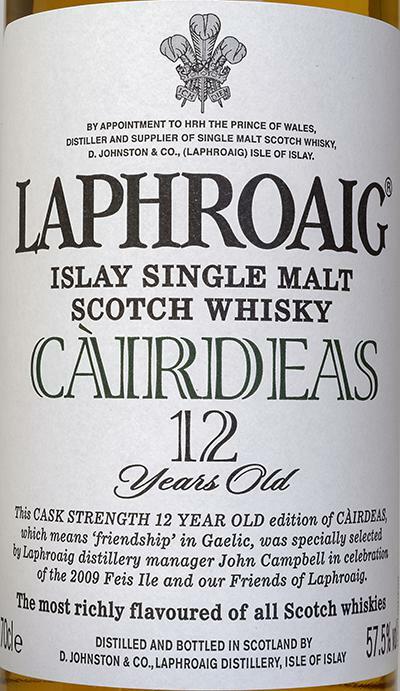 The finish fires its mouth for a long time, leaving behind a subtle, pungent aroma of peat. Tasted during the Premium Tasting at the distillery (July 2016). I agee with the reviewing words of peatbogger. This Laphroaig bottling is too experimental in my opinion, hard to discover and enjoy the real Laphroaig signature within. Only worth buying for collectors of the Cairdeas series, I guess. Tasted at Laphroaig Premium tasting. It tryes to be different in too many ways, ending up a bit caracterless. I find it a bit out of ballance, like the different components compete to get in focus, not bad but my least favourite Laphy so far.